Punkte Benötigt: 4400 Por favor, añade este título a tu Lista de deseos e Inicia sesión con tu cuenta My FedEx Rewards desde un dispositivo compatible. NOTICE: Activation key must be used on a valid Steam account. Requires internet connection. Early access gameGet instant access and start playing; get involved with this game as it develops.Note: This Early Access game is not complete and may or may not change further. If you are not excited to play this game in its current state, then you should wait to see if the game progresses further in … development. About the gameSan! Ni! Ichi! Hajime!!! Stretch your muscles and embark upon the ultimate marathon of Japan in a crazy party racer! Hurdle barrels, outrun Shiba Inu and dive out of the paths of bicycles - all while wanging fruit at your opponents and dashing across planks precariously balanced over waterfalls - in an unreal marathon across the whole of Japan! Key Features	Four-player madness! You can’t spell Nippon Marathon without ‘P’, ‘A’, ‘R’, ‘T’ and *checks letters* ‘I’, we suppose… Solo play is supported, but grab up to four pads and enjoy the supreme silliness of gaming’s greatest marathon. See all of Japan! Cross the entirety of the land of Nippon in a series of creative levels spanning busy city streets, village lanes, bustling markets, mountaintop shrines and even unsafe sake distilleries! Wacky characters! Go toe-to-toe with some of the coolest racers who ever did, er… race! Lobster-man J DARWIN, unicorn onesie-wearing Elizabeth Nishibori, school uniform fan Zenbei “Xen Bae” and the completely normal Snuguru Maestro are among the challengers vying for the podium! Epic pratfalls! Swinging poles! Giant face-slapping fish! Cyclists! Shiba Inu! Panes of glass! Traffic! False doors! Barrels! Rolling beams! Wobbly planks! Flying fruit! More Shiba Inu! Dodge and dive over the lot or suffer the painful and embarrassing consequences of physics-based collisions… Tons of surprises! 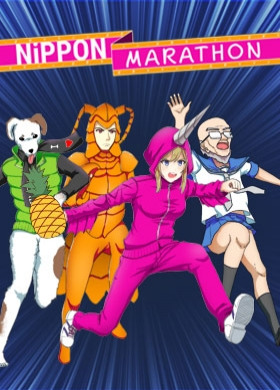 You never know what will happen next in Nippon Marathon. Perhaps you’ll find time for an impromptu spot of slot machine fun? Maybe a news anchor will jetpack in to interview you on the racetrack? Heck, anything is possible… Drop-in/drop-out play! Need a bathroom break to brush pineapple juice off your onesie? Random pedestrian passing by your couch and wants to play? Whatever the cause, hop in and out for the ultimate, flexible party get-together! System Requirements Windows - Minimum OS: Microsoft Windows 7 Home Premium 64-Bit Processor: Intel Core i3-2370M Memory: 4 GB RAM Graphics: Intel HD 4000 Graphics Storage: 5 GB available space Windows - Recommended OS: Microsoft Windows 7 Home Premium 64-Bit or higher Processor: Intel Core i5-2300 or AMD Phenom II X4 940 or better Memory: 8 GB RAM Graphics: NVidia GeForce Gtx 970 Storage: 5 GB available space Copyright Onion Soup Interactive. Published by PQube Ltd. All rights reserved.